'Cloud' dominates JDA's latest strategy announced at Focus 2012. But it is more about selling their expertise than a different software delivery model. Here we discuss what their cloud strategy actually means, as well as JDA's way cool 3D store planning product, their earnings restatement, and tidbits from the keynote address by Condoleezza Rice. JDA has arguably the strongest suite of supply chain applications of any solution provider, particularly when it comes to solving large complex problems. As a company that has grown by acquiring the best supply chain technology providers around (i2, Manugistics, E3), JDA has recently been in a period of flux for a while, trying to find the right strategy to accelerate its growth. In fact, the tagline for this year’s conference was “It’s Now. Think New.” While I’m sure they intended that as inspiration to their customers, I think it also reflects their own stage of thinking about themselves. The strategies announced at their 2012 conference give me hope that they are on the right track. Moving to The Cloud . . . But What Does That Mean? The dominant theme and most important initiative was JDA’s move to the cloud. They described this as one of the four major milestones of the company: 1) founding the company, 2) going public, 3) becoming a supply chain company, 4) becoming a cloud company. Of course cloud means different things to different people, so to be clear, they are not talking about re-architecting their solutions to be multi-tenant, single instance applications, what we would call ‘true SaaS’ (see SaaS vs. Licensed Software). Nor are they talking about pay-as-you-go/subscription pricing.1 So if it’s not multi-tenant and not pay-as-you-go, what does JDA mean by the cloud? First and foremost they are referring to their “Cloud Services,” a part of JDA’s suite of four different service offerings: Cloud Services, Consulting Services, Education, and Support Services. Cloud Services consists of managed hosting service plus a set of repeatable expertise-based services for helping the customer to get value from their systems. More on this below. Second, JDA is offering a pair of application combinations they refer to as the “Customer Engagement Cloud” (real-time price/profit optimization and other customer engagement tools to let store associates offer differentiated services, based on each customer’s profile), and the “Shelf-connected Cloud” (a platform for manufacturers to connect to retailers to integrate and collaborate at the shelf level). Rapid Cloud—this is JDA’s hosting service.2 The customer still owns a traditional perpetual license, paid for up front, and each customer has their own instance of software. The hardware is virtualized and pre-staged so that modules can be loaded and the base system ready within 3 hours. Of course, weeks or months of additional time are required to configure the system, load data, set up workflows and business rules, create accounts, set up and test integration points, train users, etc. But the underlying platform is ready to start almost instantly. 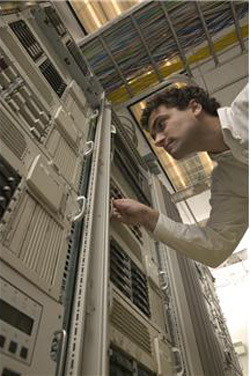 Performance Cloud—this is a managed service where, once the customer is in production, JDA takes responsibility for managing the performance, security, availability, and change management of the hardware and software components, which includes upgrading to new revisions, as well as ongoing patches to the applications, database, and OS. JDA is responsible for ensuring the performance and availability, and as such attempts to anticipate and minimize any issues and impact of patches and upgrades. As part of this move to a cloud-based platform, JDA will have to make some changes to their architecture to better support continuous upgrades with minimum disruptions. Optimization Cloud—JDA is offering its expertise, initially in two packages: Inventory Optimization, and Forecasting and Replenishment. This includes methodologies, operational expertise, and more generally getting results and transformation from the JDA investment. It differs from consulting because it is not a one-time custom project. Rather, these services are ongoing and leverage repeatable methodologies and lessons learned. In a sense, you are buying the accumulated knowledge of JDA, i2, Manugistics, and E3 (the average tenure of JDA’s employees is about 10 years). Generally, it’s delivered remotely, but in some cases they have the expert co-located with the customer, such as having a forecasting expert sit in the client’s office, working with the client’s teams, crunching through the numbers, running batches, producing plans, and putting them into a digestible format like PowerPoint. JDA’s people have done this so many times that they can do it much better and more efficiently than their customers. This reminded me very much of the Co-Managed Processes approach described in New Models for Improving Supply Chain Processes and Performance. JDA issued a press release on April 10th, announcing that financial results for 2008, 2009, and 2010 will be restated, subsequent to an SEC investigation. In our session with their executives, I asked about the status. JDA’s CFO, Pete Hathaway, said that they will be restating their historical earnings and are making good progress on the effort. He said, “we have crossed the Rubicon from an investigation to having a project plan.” They expect to release the restatement of earnings around the middle of August, at about the same time they file their second quarterly report. The audit committee and the board are involved. Once they get past the refiling, the SEC will still need to complete their investigation. Mr. Hathaway said that their investigation found no indication of wrongdoing or fraud. They will make some changes to processes and controls, which will be described when they recast their statements. He reiterated what the initial press release said, that this is about the timing of revenue recognition, not the existence of the revenue. Mr. Hathaway said that it is about the “arcane revenue recognition rules” and not about whether transactions occurred or money was collected, and that it won’t affect their cash position at all. The Optimization Cloud is different than typical cloud or hosting services. Virtually all cloud/hosting providers offer the platform, security, and availability, and some of them will provide a managed service to take care of the software upgrades. Few will offer up domain expertise to achieve the desired value and impact on the performance of the organization. Before this announcement, JDA was already a heavily service-based company (about 80% of revenue). With cloud services, they are looking to drive not just more service revenues, but also better results for their customers and a more strategic, embedded relationship. The “Shelf-Connected Cloud” is aimed at integrating the manufacturer all the way to the shelf. 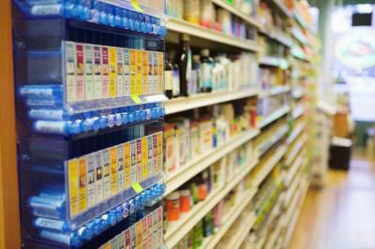 Many manufacturers still have issues with shelf availability or just having the wrong inventory on the shelf, resulting in both out-of-stocks and overstocks. JDA’s Shelf-Connected Cloud provides a platform for manufacturers to connect to retailers and collaborate at the shelf level. Traditional regional assortments and planograms are supplanted by micro-segmentation with localized consumer-driven assortments and associated planograms. JDA asserts that this is a ‘hyper-scalable’ solution, able to solve really large problems in real time, involving every product across every shelf across thousands of stores. General availability was on April 30, 2012, the day of their announcement. To illustrate the Customer Engagement Cloud, JDA did a demo. Instead of traditional demo format, they did a series of skits (done by JDA employees, not professional actors). A woman came into a ‘store’ (simulated by the three large projection screens showing store settings) and the audience could follow along, seeing the store associate’s tablet screen displayed on one of the big screens. The shopper was looking to buy a particular handbag. She told the associate she found it on online for a cheaper price. The store associate was empowered to make a margin-protected counteroffer, calculated by JDA’s real-time pricing engine, based on available inventory, how loyal and profitable this customer has been, and other factors. This showed how their common cross-channel pricing engine ensures consistency, taking into consideration many factors, including the item, available inventory, available shipping lanes. In addition, the store associate was able to see what the customer had put in their online shopping cart at home earlier that day. 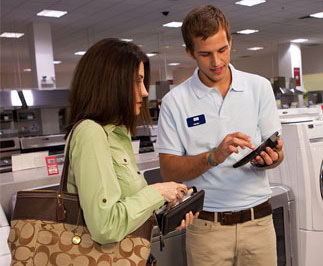 The associate was able to offer to checkout those items as well as the one the customer was buying at the store. The associate could locate inventory across the network and provide different options for pickup or delivery. They could even pull up the planogram to tell the customer exactly where it was on the store shelf, at any store. As soon as the order was ready for pickup at another location, a message was automatically sent to the customer, without any additional action by the associate. The platform makes optimized decisions such as: should you ship from another store (fastest way but most expensive), or ship from a DC, or direct from the manufacturer? Each one is a tradeoff of service, customer satisfaction, and cost/profitability which can be optimized to meet the corporate goals and strategy—the mix of profit, growth, customer satisfaction, or other goals that the company is trying to achieve. This may vary by business unit, store format, geography, customer segment, product group, or other specifics. JDA described giving the store associate this guided/ constrained negotiation ability as a ‘controlled flexibility process’ . . . a ‘bend but don’t break’ approach to dealing with the new reality of the empowered consumer. The general availability date of the Customer Engagement Cloud will be in the fall of 2012. Recently the Huffington Post recommended that Dr. Rice should be Mitt Romney’s running mate. Maybe it should be the other way around—a Rice/Romney ticket! By far the most eye-popping part of the show was a demo of JDA 3D, combining JDA’s optimization technology with virtualization technology from Red Dot Square, a virtual reality company that provides photo-realistic, large-format 3D systems that integrate planograms, CAD drawings, and product images/models to create a 3D walk-through view of the store. The system is designed for use by both manufacturers and retailers to visualize the shopper’s experience. During a demo, I shot a couple of videos on my phone, which give some sense of the size of the display and the realism of the experience. The audio is hard to hear, but in this first clip (~2 minutes) you can see the presenter build up the shelf from the store layout, populate it with products, convert product images from 2D to 3D, and then zoom in and rotate the view of a specific product. In the second clip (~3 minutes) the planner is testing out various promotional banners to see which one works the best. Then he looks at what the shelf displays will look like as product is being depleted from the shelf (which can be the actual near real-time view if integrated with POS and perpetual inventory), and demonstrates the ability to change the viewing height to simulate the view from a child or shorter person’s perspective. Next in this second clip (at about 1:05), they showed the ability to integrate a real-time view of store performance by item, color-coding the various items on the shelf based on their actual performance. This was followed (1:30) by the overlay of a 3D heat map showing where customers were most and least engaged on the shelf, integrating the merchandizing view with the store planning view. The large format 3D really helps planners get closer to what the actual customer experience will be. This system is designed to give a realistic simulation of the physical store experience, which is not ideal for ecommerce for a couple of reasons: A) large format photo-realistic 3D requires much more bandwidth than the typical desktop internet connection has, B) there are better paradigms (other than 3D store simulation) for letting online customers search for, view, and evaluate products in an ecommerce setting. This is great for retailers who are redesigning and/or re-laying out their stores. The store planners can work with the architect, and everyone can see what it will look like before any actual construction or work begins, instead of waiting until it is built and then realizing, “Hmmm, this is not quite what we imagined.” One executive at a major retailer said, “With this capability, I can fail cheaply and get out.” Just as important, the concepts can be tried out anonymously, without turning off consumers or alerting the competition to what the retailer is trying to do. JDA has some amazing technology and talent. Their new cloud strategy leverages that talent in ways that JDA has not done in the past. After all, customers don’t want systems. They want to change and improve their processes. They want better performance and competitiveness for their business. They want results. We think that the changes JDA has made are long overdue, and offer the promise to improve the actual results (and hence loyalty) for JDA’s customers.